With Ethiopia we have been patient for forty years! It is time to say: Enough! - Benito Mussolini, October 2, 1935. In 1896, Italian forces tried to invade Ethiopia but suffered a humiliating defeat at Adowa. This defeat at the hands of a "native" army haunted the Italian government, army and society for nearly 40 years. In 1935, Mussolini's fascist regime saw another opportunity to invade Ethiopia, avenge Adowa, and build an Italian colonial empire: the so called Africa Orientale Italiana. 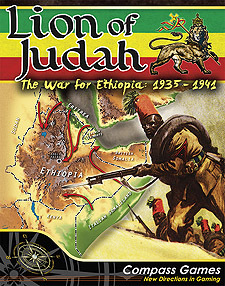 Lion of Judah: The War for Ethiopia, 1935-1941 is a simulation of the invasion in 1935-36, as well as the subsequent Allied liberation during World War II (1940-1941). The scenarios use a common rule set combined with scenario-specific rules. A random events system accounts for political and diplomatic events, pressure exerted by various political actors, tribal rebellions, and the arrival of reinforcements or blockade runners to Italian East Africa. In 1935-36, the Italian player may use poison gas, but at the risk of losing Italian Victory Points if the League of Nations event is pulled that turn. Units include regular and irregular forces from Italy, Britain, France and Ethiopia; as well as Ethiopian guerillas and exotic units, such as a German motorized company the Mission 101 forces, or Orde Wingate's Gideon Force.